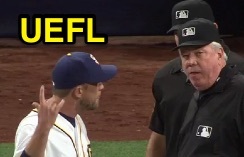 3B Umpire Brian Gorman ejected Padres Manager Andy Green for arguing a balk call by HP Umpire Mark Carlson in the top of the 3rd inning of the Pirates-Padres game. With two out and two on, Padres pitcher Colin Rea prepared to throw a 0-1 pitch to Pirates batter Francisco Cervelli. Replays indicate Rea appeared to deviate from his natural pitching motion and break contact with the pitching rubber during his delivery (illegal pitch), the call was correct. * At the time of the ejection, the Pirates were leading, 2-0. The Padres ultimately won the contest, 5-4. This is Brian Gorman (9)'s first ejection of the 2016 MLB regular season. Brian Gorman now has 4 points in the UEFL Standings (1 Previous + 2 MLB + 1 Y-Crewmate = 4). Crew Chief Brian Gorman now has 1 point in Crew Division (0 Previous + 1 Correct Call = 1). *Rule 6.02(a)(5) states that a balk occurs when, "the pitcher makes an illegal pitch." Rule 5.07(a)(1), concerning Windup Position, and 5.07(a)(2) concerning Set Position both state, "Any natural motion associated with his delivery of the ball to the batter commits him to the pitch without alteration or interruption." Because F1 Rea altered his natural motion during delivery, the pitch was illegal pursuant to 5.07(a), and, thus, a balk pursuant to 6.02(a)(5). This is the sixth ejection of the 2016 MLB regular season. This is the 3rd Manager ejection of 2016. This is the Padres' 1st ejection of 2016, T-1st in the NL West (LAD, SD 1; ARI, COL, SD, SF 0). This is Andy Green's first career MLB ejection. This is Brian Gorman's first ejection since June 4, 2015 (Buck Showalter; QOC = N [Balls/Strikes]).